Hekk Jgħid il-Malti, a project presented by Valletta 2018, celebrates the beauty and creativity of the Maltese language by adapting 13 Maltese proverbs known as qwiel in public art installations around Valletta. 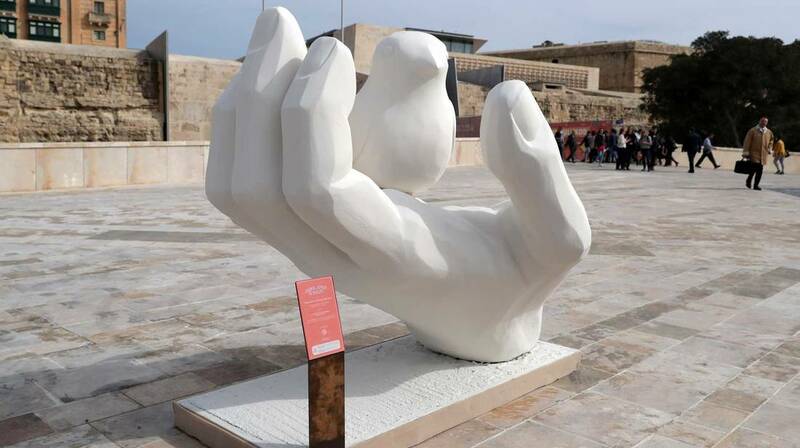 The temporary installations were unveiled by Valletta 2018 Foundation Chairman Jason Micallef, Parliamentary Secretary for Consumer Protection and Valletta 2018 Deo Debattista and artist Joel Saliba. As an artistic concept, ‘Kif Jghid Il-Malti‘ engages with these proverbs with the aim of bringing to the public’s attention Malta’s linguistic heritage. This project also reflects on the European Year of Cultural Heritage, presenting the Maltese language as living patrimony – a link between the past and the future in the form of cultural heritage. The artist Joel Salibawho created these installations with designs, said these are intended to be thought provoking and to reflect on the language. This project, supported by the Valletta 2018 Foundation, is the creative work of Ikona Artworks Ltd. Joel Saliba and Margaret Pace are the creative team behind the project who originated the concept and installation designs, assisted in the process and research by Sarah-Lee Zammit. Chris Galea for the logistical support and Perry Scenic Ltd for the manufacture of the installation works.